Elizabeth's future doesn't look promising, the prospect of a marriage that will provide the financial needs but not the love she wants. When her maid receives an offer that is one of a kind chance of a lifetime she decides to help her maid and take the offer. In order to get away from her current life, she takes her maids name Adelaide taking a new adventure as one of the girls in the Glittering Court. She will spend the next year at a finishing school to become an upper-class lady so that she can find a successful husband in the Adoria. Unlike the other girls at school, she's already a lady but she doesn't want to draw attention so she pretends to not be great but just enough to get by so that she can make it to Adoria. Only Cedric the man who made the offer to her maid knows who she really is and if she can make it through training she might just be able to get away with it. Finding friendship with her roommates who have become fast friends but when she learns what Cedric is hiding she decides that she needs to be the best of the Glittering Court in order to help. Will Adelaide marry one of the rich men or be sent back to Osfridian to her marriage that she ran away from. I loved Adelaide she's one of those characters you can't help cheering for as she takes off on a whirlwind adventure risking everything for a chance at a new life. We also get to know Cedric really well as they develop a strong friendship while Adelaide is in school and while she's being courted by men in Adoria. We also get to learn a little more about Tasmin and Mira who are friends of Adelaide while she was in the school. We also are introduced to a few characters I didn't care for right from the start but things work out in the end. I've had this one on my bookshelf forever but I never seemed to get around to it now and I'm kicking myself for not getting to it sooner. I love the idea for The Glittering Court it's a twist on the matchmaker concept but done by men who use it as a business. I instantly was hooked on the book finding it hard to put down I had to know what was going to happen to Adelaide next. The author has done an amazing job create a captivating story that captures the heart as well as the imagination. 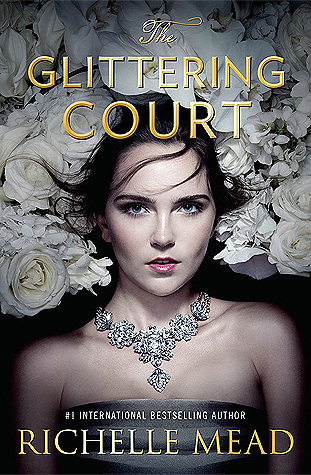 This isn't my first book by the author so I had some high expectations and The Glittering Court doesn't disappoint it's so much better than I expected. I honestly loved the book it was beautifully written and I can't wait to read the rest of the series. OOh nice! I still need to read this one as well! I had heard some mixed things about it, so honestly I've kept it at the bottom of my TBR pile, like legit, it's at the bottom of my TBR trunk in a stack! I loved Richelle's other books as well so I am still determined to give the series a try for my own benefit! Glad you were one to enjoy it! It gives me hope that I will too! Nice review! I had the wrong expectations for what I thought this book was going to be so I didn't enjoy it as much as you. It was slower than I thought it would be. But, the sequels look interesting so I'm hoping that I will enjoy them a lot more than this one.